A true displacement hull with a twist. 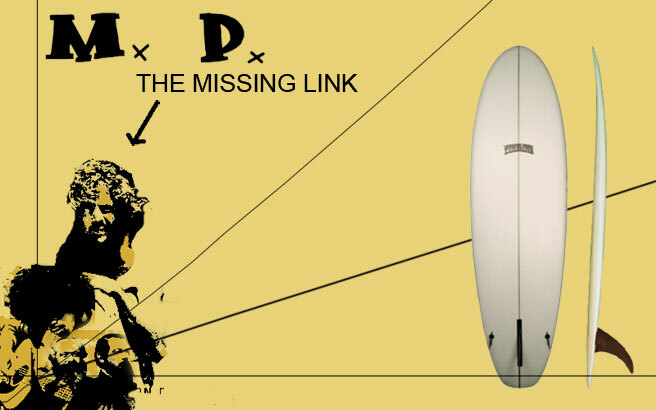 Like all good hulls, it has an “S” deck thickness distribution, with a low swing weight thin nose and a tail oriented thickness and rocker for foot-over-the-fin drive. The twist is in the tail- a classic shortboard tucked under edge immediately in front of the fin allows you to get off of the 50/50 center rail at will and gives this board a vertical dimension, while maintaining the mid-board carves-from-hell and blissful trim that are the hallmarks of all good stubs. triple fin that gives tube hold without inhibiting the quick pivot that is the best feature of single fins. In fact, the small fin actually moves the pivot towards the rail, and makes for a tighter turn and a looser feel than a single fin alone. All fins are included and all are right for the individual board they come with.